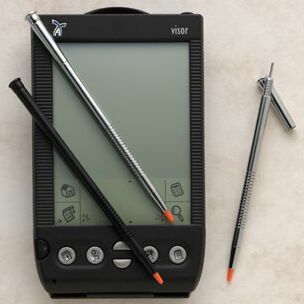 Back in the day when I had my trusty Palm III, I also owned a custom stylus from PDA Panache. Now that I have a Handspring Visor, I can throw away the piece of plastic that came with my Visor and use this instead. PDA Panache has always been one of the leading replacement stylus makers for the Palm operating system (OS). The newest custom stylus from PDA Panache for the Handspring Visor looks much like its predecessor, with some minor improvements. The custom stylus includes the EasyView™ orange tip that is synonymous with PDA Panache. The bottom third of the stylus has ridges that makes it easier to hold, similar to the ridges on the Handspring plastic stylus. The top of the custom stylus juts out so it is easy to pull out of the Visor silo. Unscrew the cap, and you have a handy reset pin for those times the Visor misbehaves. One thing I noticed about the custom stylus is that it takes longer to unscrew than my Palm III custom stylus did. This is a good thing because after a while of use, the Palm custom stylus would become loose too easily. The Visor custom stylus has narrower threading that seems to keep this from happening. The PDA Panache Visor custom stylus comes in two colors -- black and chrome. The PDA Panache Visor custom stylus does what the stock stylus from Handspring cannot -- make handwriting easy. The custom stylus is weighted perfectly for writing on the Visor, and will actually improve handwriting recognition. When not in use, the stylus can be "soft inserted" into the Visor silo for easy retrieval or inserted completely for a very secure fit. In fact, it is almost "too secure," because it can be difficult to remove when the stylus is fully inserted into the Visor. When inserted into the Visor, the custom stylus slightly juts out at the top just over an eighth of an inch (2mm). This makes it easier to pull the stylus out of the Visor, but could potentially cause problems for replacement cases that tightly fit the Visor. Note that the hard cover and soft leather case that come with the Visor have no problems. One interesting thing I noticed was when I tested the custom stylus with with the RhinoSkin Ti Slider. The black one at first would cause the Visor to come out of the Ti Slider when opened. Once I pressed the stylus all the way in it fit fine. I also tested the chrome custom stylus, and that did not go inside the Visor silo as far. This caused the chrome stylus to slightly press against the Ti Slider when the case was closed. Opening the case causes the Visor to come out of the case. I spoke with PDA Panache about the differences and they will shorten the tips in their next batch of chrome custom styli. One thing that I wish was a little different is that the custom stylus had a hex top similar to the Black Nail instead of the rounded top. This would prevent the custom stylus from rolling off a table. Not a major problem though, since the main reason for getting the custom stylus is that it fits in the Visor. The stylus can also be a little tough to get out when it is fully inserted into the Visor. » Size 4 5/16" x 3/16"